You matter less, Part III – Disorderly Conduct. I’m hoping that somebody somewhere steps up soon and explains this stuff to me. Even as an attorney I’ve never understood, and I still don’t, why normal people- people like you and I- are the least important people in criminal law. Break my stuff? That’s bad. Break the government’s stuff? That’s really bad, right? Steal my stuff? That’s bad. Steal from a corporate retailer, though? That’s somehow worse. (B) A violation of paragraph (1), (2), (3), (5), or (6) is a Class A misdemeanor when the damage to the property does not exceed $300. For those arm-chair attorneys not scoring at home, I went ahead and highlighted the nonsense part: the part where if somebody breaks your stuff it’s a misdemeanor. Unless your stuff memorializes a cop or group of cops. Then it’s a felony. There is no doubt that it’s a bad idea to break anybody’s memorial of anything. You shouldn’t do it, obviously. Every attorney would advise you against it. 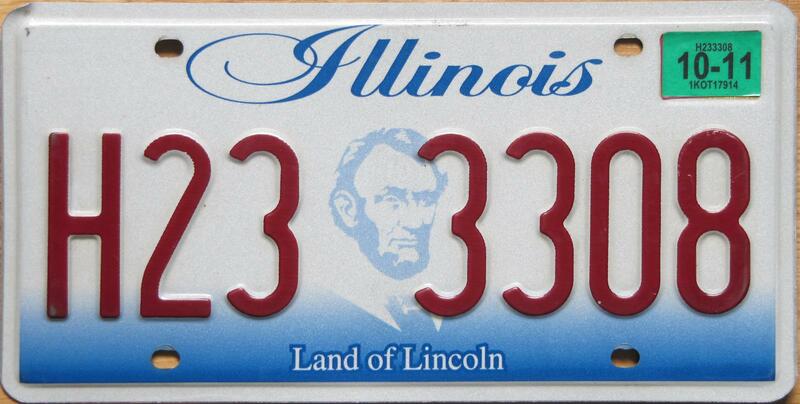 I don’t understand, though, why breaking your cop memorial license plate is somehow worse than damaging my “Land of Lincoln” non-memorial license plate. Was Lincoln not important? The reality is that everybody who is being memorialized is special to some person or group of people- otherwise the memorial wouldn’t exist. There’s really not a reason for the legislature to pick-and-choose just whose memory is more important. Previous Previous post: The hypocrisy of your outrage over Donald Sterling. Next Next post: Driver sober AND get pulled over.